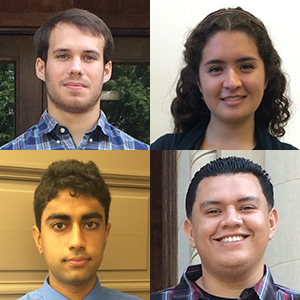 This summer, four Carnegie Summer Scholars are working on CDAC-related projects. Brandon Wilfong (Washington College) will be working with CDAC Research Scientist Muhtar Ahart on behavior of ferroelectric materials at high pressure using Raman spectroscopy. Olivia Reyes-Becerra (Stanford University) will be studying the synthesis of new materials using multi-anvil press techniques with CDAC-Affiliated Carnegie Staff Scientist Tim Strobel. Saelig Khattar (Thomas Jefferson High School) also will be working with Tim Strobel on synthesizing fuels at high pressure and temperature conditions. Kevin Hernandez (California State University - Sacramento) will be using x-ray diffraction to identify crystalline phases present in low-temperature materials synthesis procedures with CDAC Coordinator/Research Scientist Stephen Gramsch.